Bring a little of nature's vitality of plant life indoors. Printed on a cotton duck cloth, the Captiva Lined Empress Swag features windswept tropical leaves in lush colors of mossy green and golden sunrise on a vibrant red background. A ¼" twisted braid cord along the bottom frames and highlights the graceful bottom scallops of the swag. 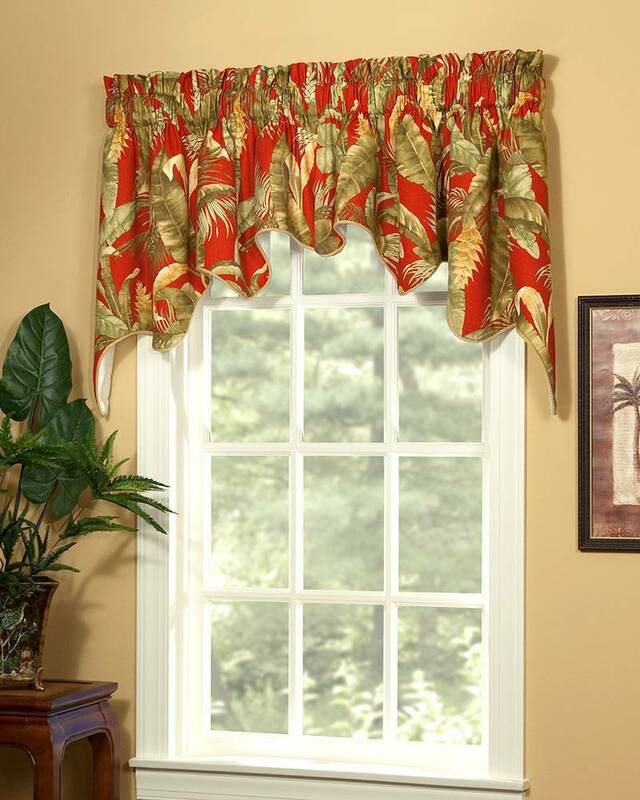 Recommended for windows 36" to 60" wide (as pictured above) - may also be combined with Captiva Lined Empress Filler Valances to cover wider windows. (Insert valances between the right and left swag panels.) Handcrafted and fully lined. Made in the USA.